I’ve spent the past few mornings and evenings at Pedernales Falls State Park, a gem in the Texas Hill Country. I love November at this park. The cypress change from green to orange. The oak turn from green to gold to red. Other trees turn yellow before their colors fade. It is always with a bit of reluctance that I bid farewell to this colorful season. The warm air gives way to the cooler air of Autumn, and I know that winter is not far behind. With it, much of my outdoor explorations are put on hold until the springtime and Texas wildflower season. In my last trip to Pedernales Falls, it is apparent the trees are shedding their color with the winds that have blown through with the most recent cold front. Much of the ground is covered with the orange needles that have fallen from the cypress. Many of the trees have lost much of canopy. 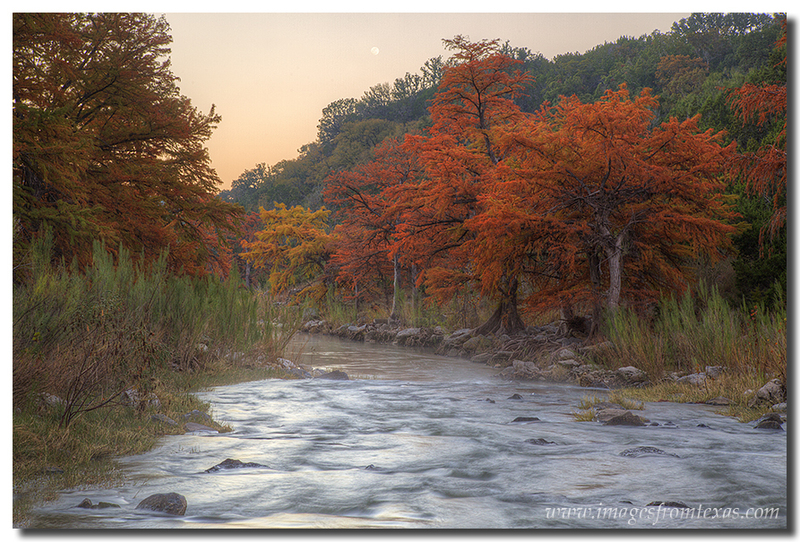 Only a few sections of the Pedernales River still offer color. The sun sets over the Pedernales River in the Texas Hill Country. In these last few images from Autumn, I’m offering a glimpse of my discoveries. In a few of the images, I wore waders to cross the river to get the best angle. I also found out I have a leak in my left boot, and that water was cold! In others, I walked several miles, sometimes retracing my steps, to find the most colorful angle. This also includes several trips from my house back and forth hoping for the best light of sunrise or sunset. So, for the Autumn of 2013 in the Texas Hill Country, I bid an adios… and I’ll see you next year. For the Texas wildflowers and bluebonnets, I’ll be waiting for you! Visit my website to see more Images from Texas. See my latest photography on my facebook photography page. As the cold weather moves in across the Texas Hill Country, leaves are beginning to change and yellows and golds are showing up along river banks. I love this time of year, and I enjoy exploring several of the nearby Texas state parks, especially Pedernales Falls State Park. 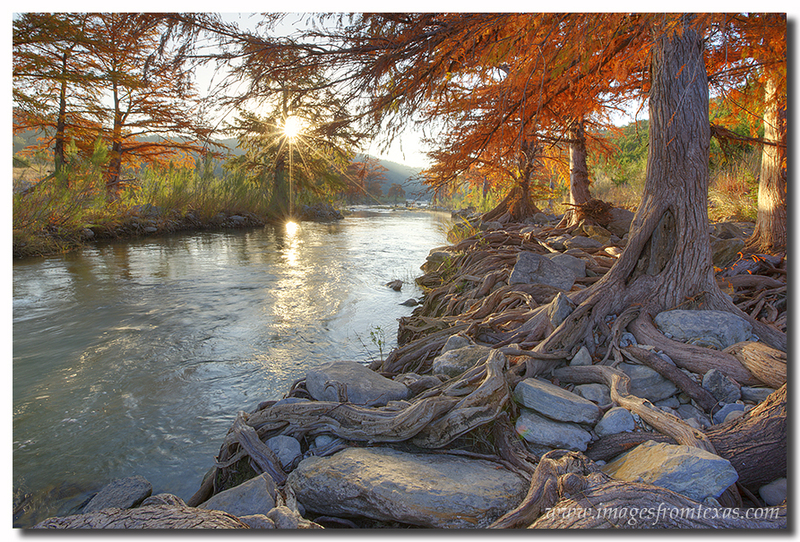 Each November along the banks of the Pedenrales River, the cypress turn from green to a brilliant orange. This year in no exception. I’ve been out there several times in the last few weeks, always hoping for a pretty sunrise or sunset. But more than anything, I just enjoy the colors of the trees and the sounds of the flowing water. There are several places I like to photograph at this park, one of which is Twin Falls. A nice overlooks allows visitors to view the small waterfall in the valley below. However, I’ve never seen anyone else there in all the times I’ve visited, despite it being close to a campground. 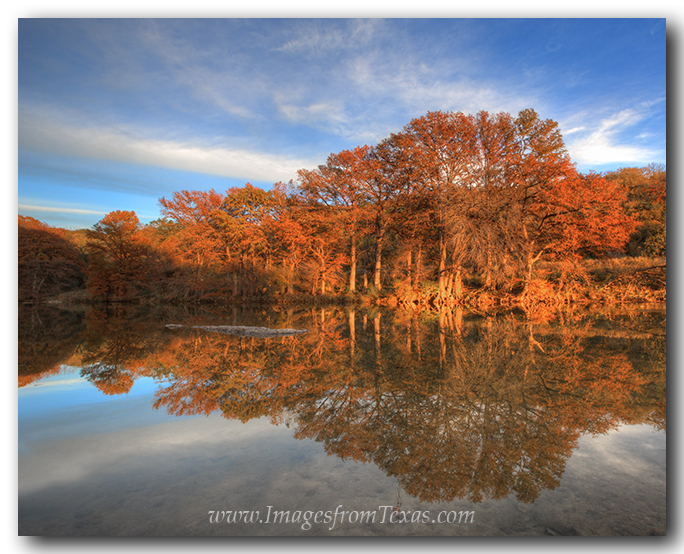 Fall Colors shine in this Texas Hill Country image taken in Pedernales Falls State Park. Another colorful section of the Pedernales River is just downstream and around the corner from the actual Pedernales Falls. Just follow the bank along a sandy bar until you find colorful cypress along the banks of the river. 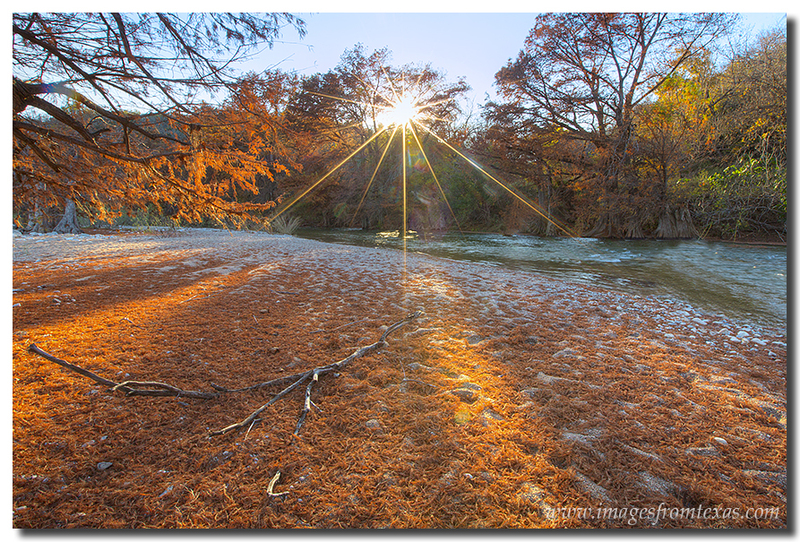 Sunrise over the Pedernales River in Pedernales Falls State Park is a glorious site. Be sure to visit here if you are ever in the Texas Hill Country. 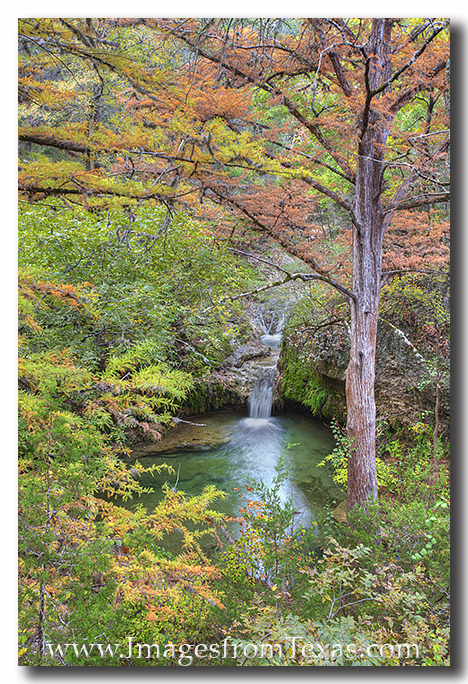 For more Texas Fall Colors, please visit my Texas Hill Country Gallery. For more Texas images, visit my Images from Texas website. I also invite you to follow the most current photographic adventures on my facebook site.